1961 - Seamark Nunn was first established in 1961 by the husband & wife team of Mike & Rosemary Nunn, making us one of the longest established family-run boating businesses in the UK. The company emerged as a boat building and chandlery business to support the growing boating community on the Suffolk & Essex Coast. From its inception, the company built up a solid reputation for building fast racing dinghies in wood and later GRP, and during the 1960s and 1970s was a favourite builder for the OK Dinghy, National Solo and International Optimist, of which many of the latter were exported into Europe. 1980  We began our involvement with the sales and servicing of outboard engines, initially becoming dealers for Seagull and Evinrude outboards. The Mariner outboards dealership was added in 1988 followed by Suzuki Marine in 1990 and Honda Marine in 1993. Our outboard engine workshop can deal with engines from 2HP-350HP, worked on by our manufacturer-trained technicians. We are now one of the largest outboard engine centres in East Anglia and can offer servicing and repairs both on-site and off-site where required. 1999 - saw the launch of our first ever e-commerce website, making us one of the first UK chandleries to start retailing marine products online. Our website www.seamarknunn.com now delivers a significant proportion of our total business and we pride ourselves in keeping our prices as competitive as you will find anywhere on the web. 2006 - after a 6 month building project and significant investment, we opened our newly expanded chandlery, more than doubling the size of our retail and office space. 2012 - Seamark Nunn were announced as Marine Retailer of the Year 2012 at the Marine Trade Association / Boating Business (MTA/BB) annual industry awards dinner held during the London International Boat Show, confirming our position as one of the leading marine equipment suppliers in the UK. 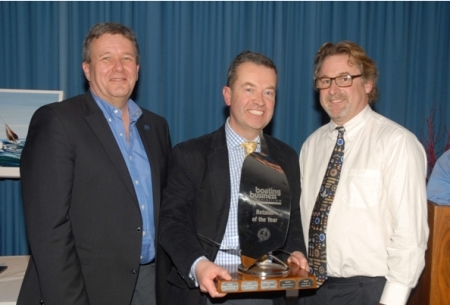 Seamark Nunn's Andrew Nunn (centre) receives the Marine Retailer of the Year Award from Charlie Mill, MD of Ocean Safety (left) and Chris Murdoch, Chairman of the MTA and MD of Nauticalia Ltd. (right) at the MTA/BB Awards Dinner at the London Boat Show. Our choice of outboard engine products was complemented by the introduction of the Torqeedo range of electric powered motors - we are now the largest Torqeedo dealer in the UK by units sold. In 2014 the Yamaha outboards dealership was added to our portfolio of premium marine products, reinforcing our status as the #1 outboard engine dealer in East Anglia. Outboard Engines & Spares from Honda Marine, Mariner, Suzuki, Yamaha, MotorGuide, Minn-Kota and Torqeedo. We also have extensive workshop facilities for servicing and commissioning of outboard engines. Ropes & Rigging from Liros, Kingfisher, Marlow & Ormiston.